With the growing gaming market across the globe the sales of gaming peripherals have also gain momentum and reaching new highs. A major portion of gaming industry is acquired by the console and PC gaming, which is in a growing phase despite the rapid growth in mobile gaming across the globe. About a third of the global population is an active video-gamer and the is likely to grow in future, which will augment the demand for gaming peripherals such as gaming mice, special keyboards among others. The interactive gaming industry is continuing to evolve as gamers of all ages and background continues to play games at home and on-the-go and the growing sales figures of gaming peripherals are reflecting change in market. Goldstein Research analyst forecast the global Gaming Peripheral Market to grow at a CAGR of 7.0% during the period 2016-2024. Further, the global Gaming Peripheral market is predicted to reach USD 3.8 billion by the end of forecast period. 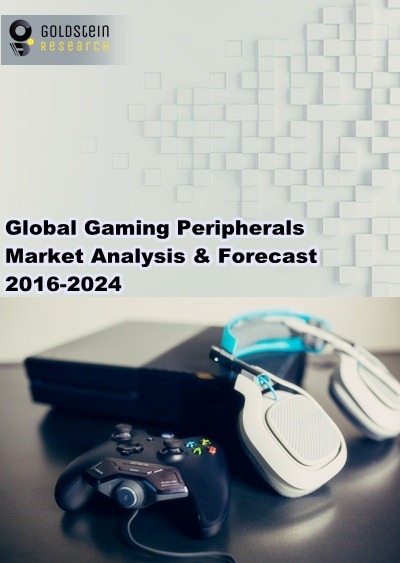 The report covers the present ground scenario and the future growth prospects of the global gaming peripheral market for 2016-2024 along with the total revenue and unit sales of gaming peripherals in every region. We calculated the market size and revenue share on the basis of revenue generated from the each segments by major players in Gaming Peripheral manufacturing and distribution across the globe. On the basis of gaming device, PCs dominated the global gaming peripheral market with more than 60% market share in 2016. The segment is likely to dominate the market with a CAGR of 7.4% over the forecast period. Global Gaming Peripheral Market Outlook 2016-2024, has been prepared based on an in-depth market analysis from industry experts. The report covers the competitive landscape and current position of major players in the global gaming peripheral market. The report also includes porter’s five force model, SWOT analysis, company profiling, business strategies of market players and their business models. Global gaming peripheral market report also recognizes value chain analysis to understand the cost differentiation to provide competitive advantage to the existing and new entry players. Our global gaming peripheral market report comprises of the following companies as the key players in the global gaming peripheral market: Alienware, Logitech, Razer, Mad Catz, Turtle Beach, Corsair, Cooler Master, Sennheiser, HyperX, SteelSeries, Anker, Roccat, Reddragon, Das, Gamdias, Sades and Plantronix. According to our global gaming peripheral market study on the basis of extensive primary and secondary research, one of the major trend that driving the growth of gaming peripheral market is the rising demand for virtual reality devices for gaming. Gaming peripheral makers around the world are developing new controllers and accessories that make virtual reality gaming more immersive. According to the report, major driver in global gaming peripheral market is huge popularity of e-sports gaming. The global e-sports gaming market accounted for more than USD 600 million in 2016, and is likely to show y-o-y growth of 41.3%. Rapid growth in e-sports gaming market has up-surged the demand for advanced gaming keyboards and gamepads and the gaming peripheral market is projected to grow over the forecast period with the continuous enhancement in gaming contents. Further, the report states that one challenge in global gaming peripheral market is high cost of gaming peripherals. Despite availability of advanced gaming peripherals such as DPI mouse and anti-ghost switches, gamers are reluctant to spend more money on gaming peripherals due to their high prices. Geographically, Asia Pacific region dominated the global Gaming Peripheral market, accounted for more than 28% revenue share in global gaming Peripheral market owing to expanding gaming market in countries such as China, India, Japan, and South Korea. Asia Pacific region is anticipated to be the fastest growing gaming peripheral market, which is likely to expand at a CAGR of 7.5% over the forecast period. What is the total market size by 2024 and what would be the expected growth rate of market? What is the total sale 2015-16 (Unit) and what would be the expected demand of Gaming Peripheral over the forecast period?